This is a low budget stage light that is really really bright. Its suitable for stage lighting, photo-booths, construction etc. Each stage light has 140 LEDs super bright 5050 LEDS (day white) on 12 rows and takes approx 30 minutes to make. The LED strip lights come with a sticky back allowing you to stick the strips to a surface easily. This can be scaled up for any size light, just remember to scale up the power supply as these lights use 2A each at 12V (24W). The soldering method is simple, you need a piece of wire with no insulation attached and on one column you attach all the positive terminals and on the next column you attach all the negative terminals. This saves having to try connect wires to the ends of the strips, something which is difficult and makes LED strip projects fall apart quickly. Cut the LED strip in to 20cm sections. 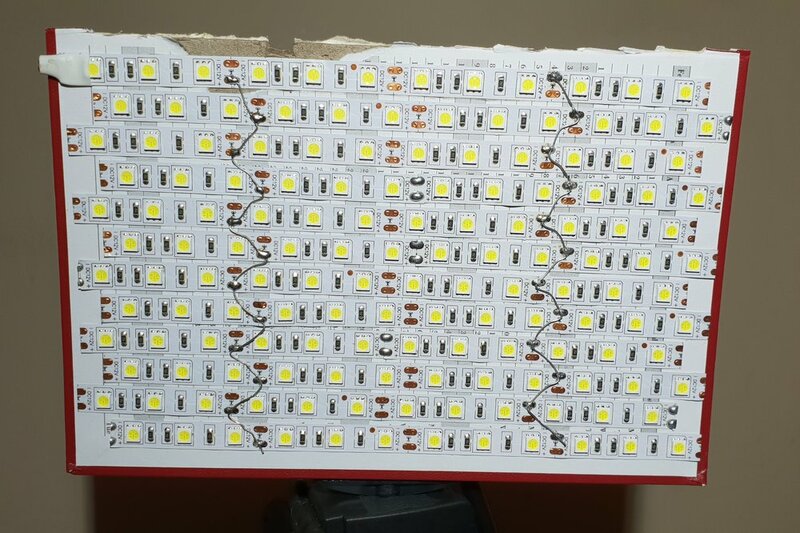 For the A5-sized light you will need 12 strips per light (2.4M). Cut a 5mm by 10mm rectangle out of the top of the backboard for the power cable and attach all the strips, as seen in the images, ensure they are all the same direction such as positive on top. Add solder to each of the positive tabs on one side and add solder to each of the negative tabs on the other. Get a piece of wire approx 30cm long, attach this to the first soldered tab. Bend the wire and attach it to the next tab until all the strips are connected. Repeat for the other side. Attach a power cable to the red and black wires and connect this to a 12V 2A power supply. Secure this in place using a glue-gun, as seen in the picture. You can also attach a tripod camera mount to the back using a glue-gun to allow the panel to attach to the tripod. Connect the LED panel to a 12V 2A power supply. - Attach new red and black wires to the LED panel. - Ensure all of the solder joints are strong and the wire doesn't touch any of the other tabs. - Ensure all of the LED strips are the same way up. - Check for the wire shorting anywhere.